Knotwe came across Polly Hardy's work on Twitter. We were intrigued by a photo she posted and wanted to learn more. A lesson was learned here: sometimes following your curiosity can be a very rewarding experience. Ms. Hardy was kind enough to give us some interesting responses to our probing questions. I started hand sewing seven years ago after my son was born and I had an acute and overpowering urge to create in a really physical sense. I classify my objects as dolls rather than sculpture, but note that their conceptual intent leaves them in the territory of art objects rather than, say, a toy or craft item. My exclusive use of pre-loved fabrics, initially a financial necessity, is now borne out of an awareness and appreciation of the depth and richness they bring to a piece of textile work. I re-appropriated vintage fabrics and accessories including antique fur stoles firstly to physically construct my work and secondly to add a depth or 'reality' to my dolls. I believe that using traditional hand sewing techniques and fabrics, an emotional narrative is created through the making process giving these 'conspirators' an emotive and uncanny quality. Q: It is fascinating that you define this work as referencing dolls. The term doll for me calls to mind the porcelain dolls or more contemporary dolls such as the Barbie doll or American Girl dolls, or action hero figurines etc. There is certainly a rich history surrounding doll-making however your mixing of materials and blending of vintage fur stoles and taxidermy has a different take on what a doll is made of or looks like. 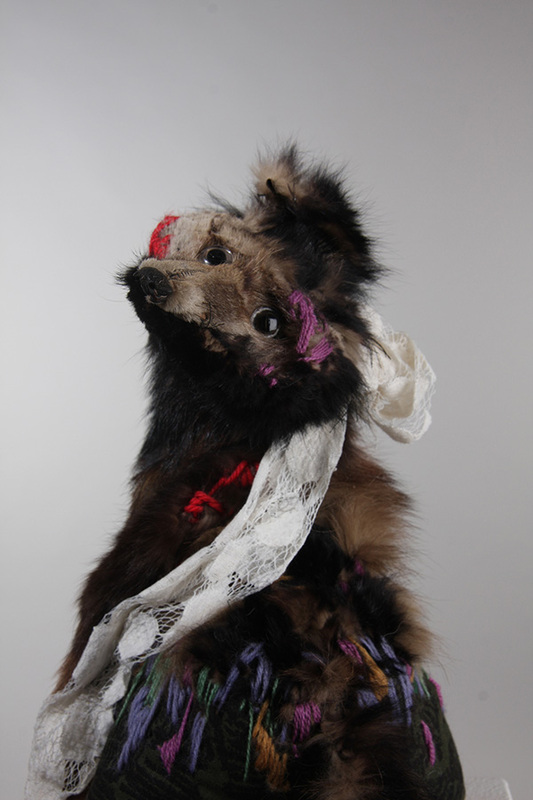 Can you describe how the vintage stoles and taxidermy became the armature embodying your dolls? A: I would [say] that initially I didn’t sit down and think 'I want to make a doll'. I wanted to make a sculptural form that embodied my thoughts on being human, maybe visualizing the true self. I am interested in how, innately we are animals but have manipulated or elevated ourselves into something more ('more' being a self proclaimed 'more' as top of the food chain and perhaps 'civilized') however we are still incredible primitive and instinctual creatures. We almost fight against what makes us human or at very least, there is a huge inner struggle between morality and instinct. Untitled 17, 57cm height, vintage fox stole, cotton, vintage ribbon, adapted vintage crochet, wire, beads, gems, found ceramic, 2014. My first visualization of this concept (first doll) was a fox head ( from a stole because it was cheaper) slapped on a rather unattractive body, I had fashioned out of clay and spray painted, [a] highly stylized in 'man-beast' form. It was not my finest hour as an artist but I see it as almost a 3[D] sketch of this initial idea. I used the fox head because I wanted an element of distorted reality (these animals were real) to the object and I wanted it to be something stronger than an animal dressed as a person or vice versa. That it was a fox before has no importance as in there is no symbolic meaning of a particular animal (character traits in folk law, for example). I use the stoles for exactly the same reason in my current work although I feel my intentions have progressed. My initial push to them becoming dolls was due to coming across boudoir dolls while researching (very interesting as a concept and worth a google). They were dolls for adults, carried by adults in the 1930's/40's. They were used as a confidant or companion. These were who you could tell all those inner secrets to without ever having your secrets shared. They could be manipulated and controlled, [their] love for you ( imagined by the owner) was unconditional, I do look upon them as the first sort of 'therapy to the masses'. Moving on from this in a material driven sense, I started to get very interested with how a textile shows wear, age and ultimately as a medium it has the capacity to show visual signs of emotion. Rag or handmade dolls became a huge source of inspiration as I loved the contradiction in styles/ repairs that tell a story....show a life. Referencing porcelain dolls when children became less careful with these precious and expensive items ( consumer culture) parts of these dolls were brought to life again with new cloth bodies or [amateur] repairs in fabric, although such a contrast to the porcelain, they still blended in a really emotive and humane way, something I try to achieve with the manipulation of the fur and fabric. Because all the while I was really getting into the thinking of Freud, Lacan and Winnicott ( transitional objects), I moved far away from the image of say Barbie because to me they are an idealized version[s] of ourselves but with no substance. I think of my dolls as Conspirators not 'idols' which has pushed me to where I am now in my thinking where I want them to feel or be perceived as something real. Narrative through the choice of fabric then becomes very important, pricking memories, making an inanimate object relatable by an emotive response to a textile or grouping of textiles. As a note I have made many prototype dolls from ceramic but find them cold and 'unhumam' however realistic the form. Untitled 7, 30cm height, vintage stoat stole, vintage cotton, embroidery wool, artificial flowers, silk, found trinket box, 2014. Q: You are participating in the New Designers 2014 show in the UK. Are you looking forward to any particular aspect of the exhibit? Who are you keeping an eye out for while you are there? Are there any particular designers showing that you want to share with us? A: I am just so interested in breathing in a huge heap of fashion and textiles work. I come from a 3[D] course and am the only person to use textile as my main medium. I have also been pulling 8-10 hours of hand sewing every day for the last 5 months and so just to be around that much talent and creativity with be so amazing rather than in the 'sewing pit' as I affectionately call a corner of my from room. Because of said 'sewing pit' I have only really had time to peruse at any length my colleagues (Colchester School of art and design) beautiful ceramic, wood and metalwork which I find inspiring every day in the sense of both craftsmanship and creativity. Q: How did you find your source for these vintage items and have you had challenges working with them? A: I am on every level 'thrifty' to say the least and would choose a boot sale or charity shop over Harrods any day (the possibility of what may be found is truly addictive). I believe vintage fabrics have more pro's than cons in my mind as the quality is far superior to modern fabrics of an equivalent budget. The fashion for all things vintage has obviously closed this gap somewhat but I still feel this is a relevant point to make with fabric shops charging a fortune for even the most basic of fabrics. I also find vintage textiles so rich and varied in pattern and texture. Many of the stoles however and indeed some fabrics with age can be very brittle and using really good quality needles and thread make this easier but still fraught with peril (I also make traditional patchworks and hand appliquéd quilts and this is a big issue). I try to stay fluid with the dolls and work with my mediums natural form and also its restraints. I use Ebay [for] most of the stoles as I use [too] many to just wait until I happen across one at an auction or [a] vintage shop. I would say 70% don’t look like [their] picture though so [I} may not use it for months. Untitled 27, unidentified vintage stole, vintage cotton, adapted vintage crochet, wire, embroidery threads, 2014. Q: Your documentation of these works gives the viewer a certain sense that these are portraits. The interesting thing is that the portraits either imbue the doll with a certain degree of decrepitude or like their form has been victim to the materials stitched on them. In particular, the piece with the map of the internal organs stitched on or the fox that has a garden growing from it's abdomen. When you begin working on a doll is there a specific character or narrative that drives how you assemble and even pose them? Where do think this comes from? A: Many people comment on a sadness to the dolls and as a whole I am drawn to that as a big part of what makes us human. The imperfections or quirks, the scars, everyone gets worn in [their] journey. Everyone at some point, is worn by love. I would say the aesthetics of the circus or freak show has been on my mind throughout my graduate collection, with say the pigeon, I added lace to almost 'make the most' of the heavy dead leg. I have also been interested in the thought of how these dolls would deal with the burdens of knowing so much and at being at mercy to another persons whims and play but never releasing that. I started thinking of [armor], we protect our organs with [armor] and they show, we are human, I have chosen a folk like [naive] embroidery to depict this and looked [at] lots of old embroidery, wax anatomical models and early tattooing as research and reference. When I first started making the dolls in 2013, I was very structured to my approach and what I wanted to achieve conceptually with each doll. This year, I have let individual pelts really drive me and I have little to no pre-conceived ideas to a particular doll. I am always looking and documenting visuals I have found interesting and trying to perfect different techniques or improve my traditional skill base such as embroidery. Take the example of the laying dol,l with flowers and butterflies, when I saw her I [thought] 'she must be sleeping' then I happened across some beautiful crochet with butterflies and some vintage embroidery yards and just let it happen, I suppose. I then liked the idea and so used a similar technique with the standing foxes chest. With such a lovely stash (if I do say so myself) as much as using any found object within art or craft can be restrictive, I believe these restrictions cultivate creative thinking and the way we perceive a medium or technique. These dolls [although were] made as individual pieces displayed in my degree show as a procession (I wanted to create a stronger narrative with reality without making assumptions as to what the viewer should feel when they looked at them) and so I may have been subconsciously aware of this when deciding a pose. Q: Did you have any thoughts on the work reflecting a commentary on the fashion industry or general consumerism? In some ways I can see these dolls as surrogates for inhumane treatment of workers or the abuse of animals and animal bi-products in consumer culture. Were you thinking of any of these or have you found these works lead viewers to such a discussion? A: I would not say I have thought about them in relevance to the fashion industry when making the dolls but I will admit to being a 'little picture' thinker as a whole (individuals really capture my imagination). I have however had a textiles student immediately say this to me before so I think the imagery would be very relevant to comment on the subject. I have spent a lot of time making and thinking about these dolls but I try to create without pushing a meaning onto the viewer. I don’t care what people think about when they see the dolls I [just] hope they make them think or feel something. I would also say my use of textile is very anti-consumer culture. I value the hand made, good craftsmanship and creativity. Throw away products or culture although exciting and ever-changing holds little worth when I look at objects that have been treasured for generation, restitch[ed], reused [.] I feel textiles is the ultimate medium for what is now called 'up-cycling' but has really been done historically with fabrics and garments for so long. There is always a place for innovation and the new but to look after and preserve what is already around us I believe is incredibly important right now before it disappears. From a craft standpoint, I also believe the same can be said for traditional craft techniques and generational skill sharing. We have almost lost it and it needs to be preserved, shared and added to by this generation and the next. Q: What are your thoughts on art, craft and design as labels for work? Do you feel as a maker that you define yourself in one or are you interested in the intermix? A: After much thought, I recently settled on the title of Textile artist for myself. I am a maker through and through but I believe the conceptual side of my work is very important to me, why and how I make and I would say that is more of an 'art' rather than 'craft' thing. I feel everyone has a personal eye or aesthetic when making and also an ability to problem solve ( much of craft is solving problems particularly when learning something new OR pushing a traditional technique in a new way, to innovate) this side of it to me is design. Everything I like and aspire to is a mix of old and new, innovation and tradition, I feel the label is of very little importance in our current society compared to say bringing back the tradition of group making or non-academic teaching of skills. Q: Lastly, are there any new project ideas that you are kicking around with and eager to move into next? I have really caught the embroidery bug and have started a large scale piece of work surrounding this. I am also open to the possibility it will not involve fur ( shock horror) lol. I am also very lucky to have been asked to make some dolls on a bespoke level working very intimately in design and fabric choice/ narrative with the client which feels a really exciting way to make so will be working this along with hopefully showing my existing pieces. Polly Hardy is currently showing at the New Designers exhibition in London.